Egyptian President approves anti-terrorism law that sets up special courts and provides protections to its enforcers. 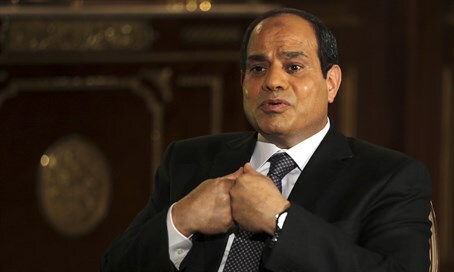 Egyptian President Abdel Fattah al-Sisi on Sunday approved an anti-terrorism law that sets up special courts and provides protections to its enforcers in the face of a two-year-long insurgency that aims to topple his government, Reuters reported. The law also details sentences for various terrorism crimes ranging from five years to the death penalty. It also shields those applying it, such as the military and police, from legal ramifications for the proportionate use of force "in performing their duties." Sisi had promised a tougher legal system in July, after a car bomb attack that killed the top public prosecutor, the highest level state official to be killed in years. Forming or leading a group deemed a "terrorist entity" by the government will be punishable by death or life in prison, the law says, according to Reuters. Membership in such a group will carry up to 10 years in jail. Financing "terrorist groups" will also carry a penalty of life in prison, which in Egypt is 25 years. Inciting violence, which includes "promoting ideas that call for violence" will lead to between five and seven years in jail, as will creating or using websites that spread such ideas. Journalists will be fined for contradicting the authorities' version of any terrorist attack. The original draft of the law was amended following domestic and international outcry after it initially called for imprisonment for such an offence. Egypt also accuses Gaza terrorist groups of providing support to Sinai Province in carrying out the attacks. The Egyptian army imposed a curfew on Gaza on October 25, following two deadly attacks in El-Arish, which killed dozens of soldiers and which were also claimed by the group.